We are an Independent Insurance Agency, which means we have made available some of our best companies for your online quick quotes. Phones answered evenings and weekends so feel free to call Jerry for a quote. Exceptional rates for Auto Home Insurance bundles in Central Iowa. Pricing you want with the service you deserve. I look forward to talking to you. We service the Grimes area and throughout the state of Iowa. At Jerry Holbrook Insurance Grimes Johnston, each one of our clients is given a dedicated team of experts that work together to proficiently address all your concerns. We have been helping Iowa residents with their insurance needs since 1989. 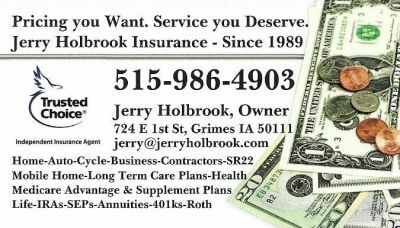 We offer all types of Personal Insurance coverages to our clients in Iowa including Homeowners Insurance, Auto Insurance, Motorcycle Insurance, SR 22, and Medicare Supplements. Give one of our agents a call to save money on your Business Insurance. Some of our Commercial insurance coverages include Contractors, Business Owners Policy (BOP), Commercial Auto, General Liability, and Commercial Property. Just give us a quick call today at 515-986-4903 or Submit one of our quick online quote forms - with the help of our dedicated business partners; we conveniently offer an entire solution for all your insurance and business needs. Phones answered evenings and weekends. We are looking forward to speaking with you.